This interview took place on: 5/15/09. 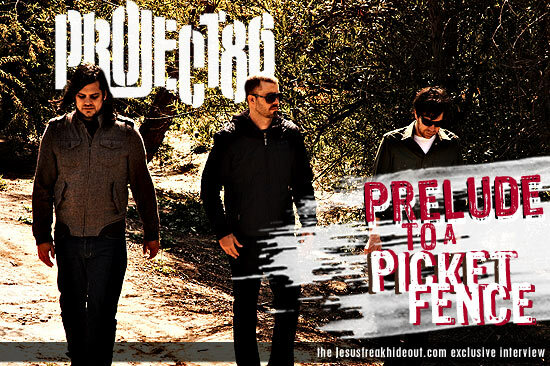 Jesus freak Hideout (John DiBiase): So, tell me about Project 86's new record, Picket Fence Cartel. What does the title mean? Andrew Schwab: The thing that we like doing as a band is trying to come up with - in everything that we do, but especially with song titles, album titles, lyrics, artistic themes, visual concepts - something that provokes an image that makes you contemplate or think. And just as a music fan, or as someone who's a fan of art in general - whether that's a photograph or a painting or a piece of music or something I read - the things that inspire me the most are ones that cause me to reevaluate some idea or think about something in a new light. Those are the things that always seem to stick with me. Or, to put that another way, artistic pieces that provoke your imagination. The thing we liked about this title, as we were sifting through a bunch of potentials, is that it implies a sort of oxymoron -- one thing that doesn't necessarily belong with the other. An ironic statement. It's as saying there's something going on beneath the surface or behind the exterior that is totally not what it seems. And that's sort of been a theme throughout the history of the band. And it just really fit for whatever reason. When we pick album titles, we usually just brainstorm hundreds of different things that are written over the course of a period of time, and then go back to that list. We usually go through three or four revisions, and different people along the course of making the record have thrown in different ideas. At one point, we'd have Post-It Notes in the studio and we just brainstorm. A lot of that, even with the lyric writing process too, it's a brainstorming process. And then some things just sort of evolve out of that. JFH (John): Are there any particular songs you're really excited about on the new record? Andrew: I think the first single, which we will actually be debuting on our MySpace and Facebook next week, is a song called "Dark Angel Dragnet." It's actually track four on the record. I think it's cliche, usually, when bands plug their single or whatever, but I actually think this is one of the best songs on the record. And it's one of my favorites, lyrically, too. It's not my very favorite. It's one of those songs that sort of came out of left field in the recording process. When you're demoing songs, you usually have the ones that you think are going to be the best songs on the record - or your favorite songs. And then, at least in our experience, every record we've ever made, there's always one or two that come out of left field that are just like, "Wow, we didn't think this was going to be anything and it ended up being something totally different and cool that we really liked." And I think that was one of those songs. It's definitely top three on the record for me. It's just got a good contrast of all the different sorts of things that make our band what we are sonically. It's got a melodic element to it, but also a heavy element to it, and a creative element to it, and it's really driving, and it's got that sort of groove the people expect from us as well. So, I think people will really dig that jam. JFH (John): What are your other two top songs then? Andrew: I think for me my favorite songs on the record are tracks one, four, and eleven. Track four is the one I just mentioned, track one is a song called "Destroyer," just kind of a longer epic kind of song. And track eleven ["To Sand We Return"] is also kind of a longer epic kind of song. Again, kind of celebrating the different things we like to do as a band and we feel like we do well -- which is the heavy sort of inspiring element with driving riffs and sort of that up and down dynamic that we feel makes a cool song, y'know what I mean? Where it takes you kind of on a ride. And I think all three of those songs do that. JFH (John): Before you mentioned liking the lyrics for "Dark Angel Dragnet." What is it lyrically about? Andrew: The song in general is just about the idea of escape. The idea of a narrow escape from something that could have been very disasterous. And that sort of thankful relief that comes along with, "Wow, I just stepped off a curb and I could have been hit by that semi truck that just went by and narrowly missed me," y'know? And the song itself is about spiritual concepts in that light. Lyrically, I just try to paint different pictures of portraying that. Like approaching your life and looking at it for what it might have been without God. I look at my life and I would probably be a completely different person if I didn't have a relationship with my Creator. And I'm picturing what might have been with that sort of sincere relief and thankfulness. It's like, "God, thank you for stepping in, because my life wouldn't look the way it looks now." And I'm not speaking of material blessings or the fact that I get to do what I do for a living, [but] more like my internal life, the things that people don't see. The state of my heart and my soul. I liken that to escaping a plane that's about to crash by finding out in advance in the future that the plane you're about to board is destined to blow up in the sky, y'know what I mean? *laughs* And I, at the last minute, make the decision not to board the flight. And I also liken that to mafia references, saying essentially, I was about to meet a really awful ending because of my natural allegiance to an ugly lifestyle - i.e. sin. And He saved me from that. I could go on and on, but... There's a lot of imagery in the song that paints a picture in different ways. JFH (John): Who did you work on production with for the new record? Andrew: The official tagline for the album credits is "Produced by Project 86. Co-produced by Ulrich Wild and Jason Martin." JFH (John): It's not the first time you worked with Jason, is it? Andrew: We have never produced an entire record with Jason, but we've done some tracks along the way. Specifically, recording the vocals with him and that was sort of what we did this time around as well, as we recorded most of the vocal tracking with him. We also worked on the last two EP's that we did with Jason as well. JFH (John): How was this production experience different than with previous records? Andrew: This time around, we didn't really set a deadline for ourselves. In the past, we were on a really tight schedule and we really wanted to finish the record by "this date" so it could come out by "this date." This time around, we said, "Look, let's not just put out another record. Let's make sure we get the record to a place that we're happy with it." And we had the freedom to do that this time around because we were more in charge of the production duties. We've been doing this long enough now that we know what our record's supposed to sound like and we know where the songs are supposed to go, y'know? We know what sounds we're supposed to get. For me, I know where my voice is supposed to sit in the song. So the fact we approached it that way made it possible for us to go back, after we recorded something, and say, "Is this the best that it could possibly be?" setting it against the bar of things that we've done in the past that we feel have been good. That was the basic difference this time around -- putting more responsibility on our own shoulders. JFH (John): So you guys are doing the Scream The Prayer Tour this Summer. Aren't there something like ten bands on it this year? Andrew: It's a pretty big lineup and the interesting thing about the tour for fans is that the ticket prices are low. So it's big rooms -- it's like 1,500 to 2,000 seat rooms in most cities so it'll be larger crowds, but it'll be this sort of festival type atmosphere. We've got a lot of different heavy bands showing their take on what it is to play brutal music. And I think kids will be plenty tired by the time they walk out those doors at 11 or 12 at night. Andrew: *laughs* Well, Randy hasn't left the band. He just played on the record, he's in our new photos, he's still apart of the band. As we've gone further and further with this band, we've been a band for thirteen years, balancing real life with being in a band is always a challenge. We've been fortunate enough to have guys who've always been committed to making this band a priority. We still are in that position, which is a large reason why we've been able to remain viable for so long over seven records. I think with Randy, a few years ago, he was in Seattle and when we were off the road, he was doing work in the studio with Aaron Sprinkle. We all have our things that we do on the side of the band but we've always had an agreement that the band is a priority. We've always been in this unique position, y'know, like I said earlier in the interview, that we're not a band that's always done 350 shows a year. We've done a few tours a year and lots of spot dates, so we've had plenty of time to either work on the band or have down time or explore other creative things that we love doing, in addition to music or connected to music. For me, that's been writing, for Steve and Randy, that's been studio stuff. With Randy being up in Seattle, some other opportunities came his way that we were supportive of. And I think the only question for Randy's role that we've discussed along the way, is how that looks as far as touring. He may or may not be a total part of the touring picture. I know he's going to be playing a bunch of tours with us this Summer, but I think for the bigger tours and things, we'll probably have someone else playing guitar for Randy. But Randy is still part of the band and probably will always be. And he participated on this record, etc. And as we get older, we all have families and other things that we enjoy doing, and I think that's probably true for a lot of bands out there and you just have to find a way to balance that and just keep the band moving forward as long as everyone's in agreement that you want to keep putting out music. And for us, I've never wanted our band to exist on this sort of different plane than what it's always been. And that's why, again, we've been able to always do what we've been able to do for as long as we have. We keep pushing forward and that's the goal. JFH (John): Have you found the live fill-in for him yet? Andrew: No, not at this time. There's no permanent situation yet. But just to reiterate, we're not looking to replace Randy, y'know what I mean? It's really just like a pinch-hitter who can play his role live just for some dates. Randy's going to be playing throughout the Summer on some festival dates and stuff like that. I don't want fans to think they're not going to see him anymore, cause that's not the way things are going to go either. JFH (John): Is he going to be on the Scream The Prayer Tour? Andrew: He's not going to be on the entire Scream The Prayer Tour, but he's going to be on certain dates. JFH (John): Cause I'm sure that's going to freak some people out to not see him on that tour. Andrew: Yeah! We're just going to have to blow people's heads off anyways, y'know what I mean? And in the scope of the band, we want people to understand that there's every reason in the world to be just as excited as they've been about us than they've ever been. In no way are we changing anything as far as the big picture. JFH (John): Last time I talked to you a year ago, you were working on a new book. What's the status on that? Andrew: Well, to be honest, I worked on that a lot prior to getting into doing the record. And then I started doing the record. The book is finished, but I'm still in a place where I'm shopping to publishers and agents. My goal has been with this book to work with a publisher who can expose the writing to a new audience. So that's sort of still in process, and it's like when I have different irons in the fire, I'm kind of moving around the fire pit, turning the hot dogs one at a time. *laughs* And with the new record coming out, the book is still in process because I was devoting time the last couple months to the band. JFH (John): Do you have a title for the book? Andrew: Not yet... Nothing official. JFH (John): I see you're going to be back at Purple Door this year! Andrew: Yeah, we are back on Purple Door this year. The last time we played was 2004 with the famous mud bath. *laughs* They've actually been asking us to come back for the last three years, but it just hasn't worked out schedule-wise. This is the first year it's actually worked for us. I think last year we were in Europe when they asked us to play. We're super stoked, man, because we have a good following in that part of the country and with it just being the first show that we've had there since the last time we played, which was five years ago. JFH (John): Before we go, did you want to say anything else about the new record, Picket Fence Cartel? Andrew: I think, sonically, the record is sort of continuing down the path that we've gone as far as experimenting, but in many ways it's a more guitar-intensive record, it's heavy, but I don't want to say it's like something we've done in the past. I think fans who've been longtime fans of the band, sort of attached to that heavy element of the band, will find a lot to connect with on the record, but there are a lot of melodic elements as well. It's a pretty diverse record. And it should appeal to that wide base of fans we have. We didn't really set out to do this or to do that, we just let the music come, but definitely this time around there's an intensity there that I'm certainly proud of. Sort of a motion to the record that I think kids are going to dig. Like I said, track one, "Destroyer," has been one of my favorite jams since the beginning of the demoing process with this record months ago. It's cool because it's sort of a song that evolves, rather than hits you in the face right off the bat. I don't think we've ever really started off the record that way. So I think right off the bat, it'll set a different tone than what we've done before, but in the end it really punches you in the face. So it's going to be cool. I'm really interested in seeing people's reactions to it. Andrew: It's great man, thanks for supporting the band, too. We really appreciate all the questions! Project 86's new album, Picket Fence Cartel, streets July 14, 2009, wherever music is sold.